Trump SHUTS DOWN Campus Thugs Defending Berkeley Riot with ONE THREAT That’s Got Them Shaking! A group of open-minded, tolerant liberals at the University of California, Berkeley became so enraged at the thought of having to hear someone with opinions different from theirs speak that they responded as only liberals can: they rioted. 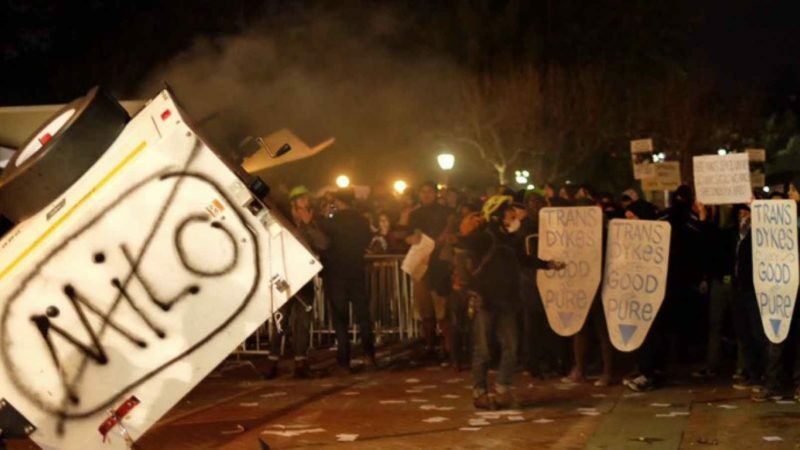 At the news that Milo Yiannopoulos would be speaking, the liberals attacked police, lit fires and smashed windows, forcing Yiannopoulos to cancel his speech and a campus lockdown. So Donald Trump responded with a threat of his own. The university chose to cancel Yiannopoulos’ speech, caving to the rioters, rather than allow free speech to flourish and punish the rioters. So Trump responded by saying that if Berkeley didn’t begin to do a better job of defending free speech, he would pull federal funding. Yet the school still cancelled the speech, for all their talk of respecting free speech. This is not the first time that Yiannopoulos, a senior editor for Breitbart, has had a speech canceled. His tour of college campuses across the country has routinely been met with protests and violence, and University of California, Davis also cancelled one of his speeches after students protested. But Berkeley argues that they tried very hard to make this speech happen.